2016 Renegade Verona Model 40 VRB. 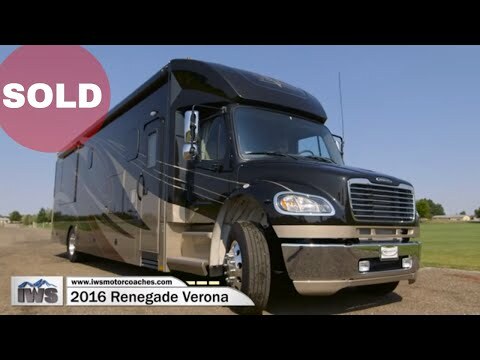 We’re excited to offer this all new model from Renegade. Family-friendly meets quality, luxury & performance. 150 Gallons of freshwater storage, 100 Gallons of diesel fuel. From the large master suite for mom and dad with our King Size Signature “Dream Cloud” Pillow Top Mattress, and a foldout bed for extra sleeping capacity. Renegade left nothing out of this family oriented coach. When it comes to luxury you only need to step inside the Verona to see the quality that only comes from a coach that is hand made by true craftsmen. For performance, Renegade chose the easy to drive Freightliner M2 chassis. This coach has a Cummins ISL 9 Engine with 350hp and 1,000lbs of torque. It is equipped with an Allison 6 speed Automatic Transmission. With a Towing Capacity of 20,000lbs and a GCWR of 60,000lbs you will have a chassis that will get the job done, day in and day out.